When I think of meditation I think of it as a form of connecting and listening to one’s inner being. It allows for an inward focus. Along with focused breathing and sitting meditation, there are various forms of meditation including repetitive physical activities, especially those that require focused or concentrated breathing, like yoga, hiking, walking, and running. Whether sitting and meditating with focused breathing, or participating in physical activities, or doing household chores in a mindful way, the energy of breathing and focusing inward allows for the positive effects of meditation to occur. These all feel similar to me, they each bring me inward while simultaneously connecting me to the whole of the universe. They allow for mindfulness within my singular perspective as well as an inner clarity that we are all connected; it’s like a spiritual figure/ground experience. Over the years I have discovered that inward focus is the most useful way to center and get a clear perspective on a situation. It is healing; it is rejuvenating. Meditation and yoga require focused breathwork. Bringing the concept of focused breathwork to an activity can create a mindful, inward focused, meditative form of activity. For me many physical activities (hiking, gardening, painting, singing, running, fly fishing, ice skating) allow me to center, bring my attention within, and focus my breath. The act-ivity with mindfulness allows for me to breathe, center, connect, and let go simultaneously. Being mindful activates the action, shifts the energy of it, so that it becomes a process whereby I can focus inward. 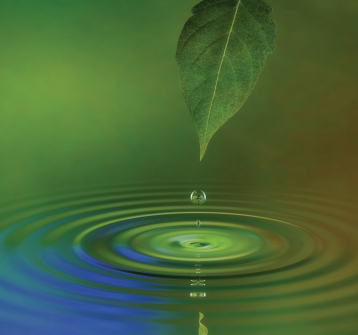 Breathing in and breathing out in a mindful way allows for a centering and connecting energy to focus one’s attention inward. This in turn allows for our vision to change such that, what and how we see ourselves, or outside situations, has the opportunity to shift perspective and usually this shift is healing and rejuvenating. Inward focus allows for the lens of our vision to change perspective. This inward mindful focus allows for balance to infuse a situation. I have used the activity of running as a meditative practice intermittently since my early twenties. I prefer to run with my dog, and sometimes with music, to allow my unconscious to bubble up that which requires my attention. The mindless repetitive action of moving through space at a comfortable breathing pace allows my mind to process whatever issue is bothering me, it allows a space for mindfulness. It makes the running the ground so that the issues that require my attention can move to the fore as the figure. It allows for me to re-view situations, interactions, or problems that are unresolved. Allowing for an inner space to see the issues from a new perspective. I think it is the reason that I don’t run in races and have a bit of a recoiling response to the thought of doing so. I have a very dear friend who is top of her game at every physical activity she undertakes. She is awesome. She began running recently and knowing that I run daily invited me to join her in training for a race. I saw this as an opportunity to share in the running experience with a dear friend and so for a couple of weeks began to focus on training when I was running. I found it to be de-stabilizing and frustrating – gone were my healing moments in my busy day where I felt connected to the universe – now there was speed work and pacing myself; rather than feeling calmer after my run, I felt a bit anxious and somewhat defeated. I discovered that I run for meditation not for training. My dear friend ran in her first race recently and took first place in her age group – it brought her a lot of satisfaction. Me too for her. My satisfaction for myself came outside the race, I had my daily meditative run and found my own inward focus to bring me the space to be at peace in my somewhat difficult world. Knowing how to get to your center will help you to rejuvenate and deal effectively with stress. And once you find those ways make sure you maintain your connection to them. Finding space and creating space for inward focus and re-balancing goes far to diminish the negative effects of stress. You may already have an activity that does this for you. Something that you are drawn to do whenever you feel stressed. Something that after you do you feel more balanced or rejuvenated. It may be spiritual or physical in nature, it may involve a talent that you have but do not promote. At any rate you will know it when you see/feel it. Because it will have the tell-tale effects of lowering your blood pressure, bringing to you a sense of calmness and balance or simply result in you feeling a positive change in perspective on things following the activity. Spend some time on inward focus and see if you can’t discover for yourself what meditative activities you already undertake and then build them in as part of your every day ritual. It’s funny how the mundane is often a way into the divine. Find your way in, and use it often. Building memories is a beautiful way to build a structure of who you are and what matters to you. What you choose to focus on to build the memory is often the defining element of how that structure will be experienced. When you build your sense of self on the joyful experiences in your life then your foundation has its basis in joy. If you build your sense of self on the trauma or things you have survived then your foundation will be on struggle. This is not a Pollyanna perspective it is basic engineering. The form takes the shape of the foundation. To be successful and flexible it’s best to allow a balanced set of memories to be the foundation of your sense of self. To allow the picture of how you survived and the whole-ness of the gift of the struggle to be incorporated with the joy and successes in your life. I like to talk about setting into memory a picture of what it feels, looks, smells, and sounds like when everything is perfect, and in place, in your life. Then you have a marker to go to, to remind you of the success you can create or experience. This is like setting an imprint into your cerebral cortex so that you can re-create it in the future regardless of your situation – aligning what it feels like with what it looks like and the outcome so that you can access the feeling senses that go with success. When I was a child, nine to fifteen years old, I was a competitive ice skater. I awoke at 4:30 to go skating before school and then went directly to the rink after school to practice more before dinner. I loved being on the ice. It was the most liberating experience. To this day, gliding across the ice brings me a sense of connection to the universe that I don’t feel anywhere else. I had a wonderful coach who was kind and firm. Each time I learned a new jump or move I seemed to naturally get it right, landing gracefully and effortlessly. Then my ego and mind would get involved trying to repeat the event – what a tragedy. It took me the longest time to learn that my being knew the way and I just had to get my head out of the way. The memory of how it felt right in my being and body was my best way to perfect my skill. Memories serve a purpose in several ways. First, to help us keep connections from past to future. Second, to mark success and mistakes to allow for learning and integration of experiences; to remind us that we have the capacity to create joy and survive trauma and loss. Third, to create a structure of who we are in the world and a pathway to success. The sweetness of a memory can shift our perspective, provide us with strength and purpose, and remind us of the whole of who we are. Take the time to consciously set into memory your successes, your joyful experiences, your remembrances of sweet interactions, and your capacity to move through transitions with transformation and learning. It will enrich your life and build a stable and flexible structure for your growth and well-being. If it is difficult to keep these in your mind start out by writing them down in a special journal that you remove and peruse when you find your energy waning. You will find that you are the best author of the beauty of your life if you give yourself a chance to write down these moments of perfection, these perfect moments of joy and experience. They can be the best antidotes to anxiety and depression because they are perfectly aligned with your being, your needs and capacities, as they come from within your being. ….I went sky-diving and rocky mountain climbing… and I loved deeper, I spoke sweeter, and I gave forgiveness I’d been denying; I was finally the husband that most the time I wasn’t, I became a friend a friend would like to have..and I finally read the good book and I took a good long hard look at what I would do if I could do it all again; ….I watched an eagle as it was flying…live like you were dying. Several years ago my dear friend was diagnosed with colon cancer. She was amazing. Over the last few years of her life she made sure that what she could do, that she wanted to do, she did. She focused on what was great about life and she focused on getting as much as possible out of life, from both a doing as well as experiencing (connecting and being) perspective. It was inspiring to witness and amazing to be close to her during this time. She allowed her compassion and love of life to guide her in her endeavors yet she was mindful of taking care of all the responsibilities involved in dying – providing for other and making sure she resolved unresolved issues. She lived as if everything she did mattered. But she was less uptight, and more relaxed about everything, too. It was as if she was savoring each moment and didn’t want to allow anger to steal any of those moments away from her. She tolerated the vulnerability of being what her heart desired because she didn’t have to worry about what end would come; she felt the urgency of being her true self because her days were numbered. It fits that when we see we are nearing the end, one of the first things to release is anger. Sure people are angry about dying but wasting precious living-time on feeling and being angry takes away the time available for en-joying what life actually offers. I think it’s an important lesson on which to focus, getting as much out of life as possible; it seems like a good thing to focus on even when one doesn’t know their fate… to live like you were dying…. to really savor and be mindful of your actions, and your relationships. Structure is important to teach but living is the most important thing that we take for granted. We focus on structure early in our parenting because we want to help our children to have that throughout their lives but I wonder if we do so at the neglect of teaching them about trusting their instincts about what brings them joy and their talents and seeing the beauty available in relationships. To create a life that is full regardless of your days, both delayed gratification and structure as well as living in the moment are needed in balance. When I lost my friend I felt I had really experienced a lot of life with her. That we had connected, and shared, and lived through things in a way that I could cherish and hold onto after she was gone. Earlier in my life I had lost my beloved boyfriend in a car accident. It was unexpected and shocking. He too, had a way of getting the most out of life – for him experiencing life mattered more than the accumulation of things. He focused on connections and relationships, and experiences. At the time, I was too figure focused and not enough ground – so when he died I really felt cheated and lost. It was difficult. But now I realize that our experiences together created a strong model for me to focus on connections and relationship and to let go of the unimportant injuries of everyday life; to see the whole of the person or experience and embrace what is good while releasing what doesn’t work. His death profoundly changed my life. I always made sure that I tell the ones I loved how much I love them, every time I see them, so I won’t regret not saying it if something were to happen. Now I am watching as my father struggles to live out the rest of his life with a diagnosis of end stage cancer. What strikes me is how it affects the people around him. He, like the individuals identified above, seems to have let go of anger and is trying to both fight the cancer and focus on living experiences each day. He has lived a very experience and accomplishment filled life. The people around him seem to have so much anger. They haven’t found their way to the importance of letting go of that anger, those left over resentments, and experiencing in the present moment what they have left. To connect and laugh and resolve the unresolved issues; to make peace with the fullness and wholeness of their relationship with him. To allow love, life, and peace to fill the time left. It’s difficult to witness and get caught in the occasional crossfire of anger. Perhaps it’s because they haven’t lost someone they really cared about before – they don’t realize the finiteness of this time. In reality all our time is finite. We each might find greater happiness if we could focus on our life as such, so that we could keep our focus more balanced. Our lives are made up of our accomplishments, and they require an element of delayed gratification – waiting to do what you want while you are creating them. But what also makes up our lives are experiences with people. Connections and shared experiences are the most amazing memories when those we love are gone. Sharing a sunset, a baseball game, a spiritual service, skiing, dinner, laughter, difficulties and joy. These events build connections and are like threads through the tapestry of our lives. They provide color and content and a type of marker to keep us tethered while we move through our lives. Balancing our focus on developing structure and doing and accomplishments with being and connecting and experiences is very important. It requires being present, knowing what matters, being flexible and firm, having compassion, understanding rights and responsibilities, seeing figure and ground, and being mindful. How we integrate cognitions and emotions, and the ways in which we reveal them to ourselves and others, is the fabric of our lives. Categories: Balance of Spirit Mind and Body category, coaching category, consciousness development, Gestalt figure ground, Mindfulness living category, Paradigm shifting, Parent Category, personal development category, professional development category, spiritual development | Tags: attitude of gratitude, balance, consciousness development, faith, freedom, healing, inner balance, instinctive health, paradigm shifting, spiritual development | Permalink. Ten days to review your last year and in some cases the years before that. To avail yourself of the acts of letting go and forgiveness and transformation. Ten days while working, playing, and living to find your way into the underworld and back. It’s a large task. In my experience there is a perfunctory approach to this, by many participating in the high holy-days in the jewish tradition, not because they do not take it seriously but rather because they are unable or unwilling to delve into those deep areas. This is the most spiritual and enlightened aspect of this tradition – to make peace. To actually create the world anew every year through this process of forgiveness. It is mindfulness at it’s best. A common style of dealing with hurts is to cut yourself off from the profound feelings that are attached to the pain you have endured. This has its price too, it keeps you stuck in the past. Unforgiveness leads to a diminishing of your personal power, a rigid world view and a truncated personality in relationship. It leads to the opposite of mindfulness. In order to forgive, that pain must be felt and then a resolution, an understanding, a paradigm shift needs to take place. This action of forgiveness and shifting releases or unlinks the pain of the event, from the event and the actor. With this new understanding, the outcome of the event, actor and experience can be put into proper perspective and into your past, freeing you to move on into the present moment of your life -> as if it is a new world. Forgiveness releases you from a historical habit reaction pattern, especially in how you relate to another or others. It allows you to engage in mindful present moment behavior, action and understanding. To forgive another a deeply painful act, betrayal, or action is difficult. To see, and accept responsibility for, how you have hurt another is also difficult. These two actions are the intention of the Day of Atonement in the Jewish high holy day tradition, sometimes due to the difficulty in the task some simply state the words and make an internal promise to do better in the future. For a real shift to take place, the spirituality behind the inner search is paramount and can result in transforming events. How do you forgive someone for that act which in your mind changed you forever? Or even for betrayal of your trust or your sense of innocence? It requires a willingness to let go of the thing that may define your stance in the world. It is fraught with deep feeling and an inner journey to your center. Certainly paradigm shifting, figure/ground perspective, and the attitude of gratitude are helpful activities. Mindfulness allows you to see a way to unlink the act and the person, the act and the circumstances surrounding the act, and the intention and the act. But even with these unlinkings and increased awareness and perspective there are difficult betrayals and experiences to transcend in order to get to forgiveness. This is especially true when the betrayal continues. When the action requiring forgiveness continues. For this kind of betrayal or transgression it is best to forgive the past and make an effort to change how and in what ways you continue the relationship in the now or the future. Forgiveness, compassion, and acceptance are partners in this atonement procedure. Some people you must forgive and accept that they may betray you again, due to their internal character. Therefore you simply change how you relate to him or her in the future. This releases the power of the betrayal and builds your resilience and compassion muscles. This is part of the intended process, you make peace at this time the best you can and then move into the new world with as much faith as possible that the new world will remain. I keep finding forgiveness. And this transition time allows for an opportunity to create peace and create the world anew. You may want to create a structure for developing a formalized transition time to incorporate elements of this tradition to view and re-view your past year and develop the qualities of compassion, mindfulness, and forgiveness. Attach it to a structure that is already part of your life. Consider doing this on each new moon, or each full moon. You can also attach it to the solstice or equinox periods. You may have such a tradition in a spiritual practice you already follow. However you choose to create a structure, the practice of reviewing your own acts or how you are holding onto unforgiveness will increase you capacity for living mindfully in the moment and experiencing healing in your relationships. Categories: Balance of Spirit Mind and Body category, coaching category, consciousness development, Gestalt figure ground, Mindfulness living category, Paradigm shifting, Parent Category, personal development category, spiritual development | Tags: attitude of gratitude, balance, consciousness development, faith, forgiveness, healing, mindfulness | Permalink. I have noticed that the world around us reflects what we are feeling, or at least how we are communicating our emotions, so if we are angry and act angry, people get defensive and snap back. something frustrating would happen and then I would try to be grateful for that thing. I had to look at how the frustrating thing was a gift. The interesting thing I got out of it was to focus on how negative things can be beneficial. Which is paradigm shifting. Sometimes it was an issue of increasing my understanding of another person or myself, and sometimes it really increased my availability to patience. The most revealing aspect of this was in my relationship to myself and those really close to me. I found that I actually felt happier with my place in the world and how I went about my days – and I found that it really strengthened my relationships because I was not just pointing out what wasn’t working but I was aligning with, and identifying, and really acknowledging what was really fantastic about what was working. This gave me a background of gratitude and connection for the foreground or figure of what wasn’t working. It allowed a space for the not-working thing to be addressed within a more positive context. I think, through this action, more collaborative work can be accomplished because people don’t feel defensive, they feel connected. In order to help in re-framing your world, part of what you have to do is stay cognizant of what is working. So the problem with walking around with the attitude of anger or mad, or feeling sorry for yourself, is the opposite of the attitude of gratitude. Being nice, looking for a way to be in your center or see the positive, results in more mindfulness, more positive reflected energy back, an internal good feeling, and more well-being. It’s not to say that being nice makes others act nicely – they have a place they’re in that comes out too – it’s more that if you start out mad you get mad in return unless you are interacting with a highly evolved person. So I suggest managing our emotions so that we don’t create more mad but allow for some even, neutral space where one can be heard, and seen. This is an important lesson for us all but especially for our children and adolescents. My daughter and I have the habit of listening to the song beautiful by Carole King in the morning. you have to get up every morning with a smile on your face and show the world all the love in you heart and people going to treat you better you’re going to find yes you will that you are beautiful as you feel…. I started this to help shift the energy in her heart when she was feeling sad or mad on the way to school, especially when she was feeling some separation anxiety, but now it seems more like a ritual to stay on track and remind her of a way to manage her emotions. I like to think of the environment in which we live as being connected to us, not so much just surrounding us, and that the energy we put out there interacts in some way with that environment. I learned this early in my life because I had an uncanny ability to positively affect my environment. How I acted, what I brought to the interaction resulted in people feeling better, happy, or sad. Now, I obviously know that we can’t make people feel anything, they feel what they feel – but there is an energetic interaction that occurs with others that have porous boundaries – what they sense others are feeling they react to – they aren’t able to maintain their own center, and so they are what they experience. This knowledge and personal skill allowed me to develop a talent for helping people in crisis situations. I have an uncanny ability to de-escalate situations – at least I do with individuals with these kind of porous boundaries or those who have some psychological issue in play that I can tap into and shift positively. What matters about this is that there is this relationship that can be affected – in both directions – so there is a way to diminish negative interactions under many conditions. If when you face the world you put on a generous, kind, forgiving face, you have a much better capacity and opportunity to receive that from the world. Be more forgiving; be more available to seeing the beauty around you; be more willing to not fight or move into anger when you’re feeling bad or another is interacting with you in an angry way. Or as Gandhi so aptly put it : Be the change you wish to see in the world. Here I’m talking about the little c in change, not the big C in Change – both matter. The little c is to smile, forgive the little things, let go, allow joy in, trust, have faith, believe, laugh and connect. Here’s sending you a hug, smile, and the energy of good job. Hope it feels good. Categories: Balance of Spirit Mind and Body category, coaching category, Gestalt figure ground, Mindfulness living category, Paradigm shifting, Parent Category | Permalink. Having worked with adolescents for most of my career I have had to hone my conceptualization and understanding of teaching about, and living in, the world of rights and responsibilities. What I have noticed is this equation: The greater our opportunity, the better our lives, the more we can provide for our children and do provide – subsequently the more rights are un-linked from responsibilities. From a sociological perspective it has it’s roots in the ebb and flow of societal comfort and how it plays out in parenting styles. From the middle 70s on we have been living in a relatively prosperous world, in our country, which allowed us to offer and give more to our children to increase their comfort. This is not to say there aren’t difficulties within families and social problems that need to be addressed – but the overall culture is that our children have had more opportunity to create prosperous lives than was afforded to the generations that preceded them. Yet, the children have a seriously higher incidence of ADHD, depression, Addiction, conduct disorder, and mood disorder diagnoses. And this is especially true in middle and upper-middle class family systems, more prosperous and more psychiatric diagnosis indicating a lack of focus, a lack of meaning, and sadness. Children have more material items, more after-school, development activities, and less expectations to give back to the family through chores and family connected expectations. Parents set up play-dates for their children and structure their days around their child’s activity schedule. Advertisers target and get out their message directly to children and adolescents – and they do so because this population has buying decision-making power. They have rights but little to no responsibilities. And because cultural activity has been changing in this direction for the last 35 years, we now have adults that have grown-up under this culture of unlinked rights without responsibilities. This allows for an ever-increasing expectation of more without any understanding of the actual requirements to create/have. Now a child has a right to whatever her parent has – an iPhone, a laptop computer, a Wii, a new car, a closet full of clothes and shoes and toys. And these are rights not requiring any linking to the way in which this money comes into the family or how everyday chores and requirements are completed and by whom, no linking to the responsibilities that go with those rights. Parents who are offering these opportunities to their child with love and caring in their hearts receive something that is surprising to them (although it maybe shouldn’t be); rather than feeling gratitude and caring from their child they are treated like employees of the child. The concept of respect for parents is diminishing; the concept of respect for elders is diminishing; the concept of community, and give and take is relegated to I take you give, in the child’s behavior. Rather than focusing on creating their way in the world children expect all things and opportunities to be given to them – that they do not need to work hard and delay gratification but rather they require and expect immediate gratification. If you look at the early part of the 20th century we had to enact laws to stop child exploitation and in years prior to that the children could be used as a way to increase the family income so that the children were treated more like employees with little take and only give. Obviously these laws were necessary. But now I wonder if the pendulum hasn’t swung a little too far in the other direction, where children aren’t given the opportunity to learn and create for themselves success tied to their own work and action; if they have been denied the opportunity to understand the importance of knowing the natural order of give and take and the connection of rights and responsibilities. The connection of their actions to their success or failure; and how systems are connected and interrelated. From a Confucian perspective Yin turns into Yang, and Yang into Yin. Both are needed to create the whole. Increase leads to decrease and decrease leads to increase, this is the natural order of things and for growth to take place and community to be successful all aspects of the community need to participate in the ebb and flow, or give and take of energy, material, support, and work. Just as the moon waxes and wanes so does our cultural focus shift from one perspective to another. In a system there is give and take – too much take and the system breaks apart – too much give and the system breaks apart. Right action is responding to the needs with what is available in a dynamic and clarified way. It is an inside-out, spiritual, energetic, material, psychological, and cognitive process. It is layered and multi-dimensional. It requires structure, strength and flexibility. It requires mindfulness and the capacity to see figure and ground simultaneously. It requires the ability to flex and stretch and bend, and be stable – seeing into the future through both intuition and rationality while feeling in the moment responsively. Right action incorporates a sense of rightness without being rigid or angry. It requires surety and sensitivity. Rights and responsibilities are a weaving, and they are not only individual but connected to small groups, and large communities. We make a mistake by giving too much. We teach the other to be takers. The key is to return to balance. Balanced action is right action. Balanced action is present moment not historical, we don’t go back in time to the parents we had that have changed into new beings in the intervening years, and exact a payment for their mistakes – we actively change our perceptions and paradigms in the here and now and create a new world in the present. In the Jewish tradition there is not an afterlife for which we need to act in a certain way to attain reward. It is not viewed that a reward awaits one – there is only here and now. But there is also reference to heaven or a sense of a new world that can be created. I believe that new world is the world we create through our children. Our actions do not only affect our small nuclear family they affect everyone we touch, and everyone whom we touch who touches another. Our actions can change the world because we affect the world in this multi-dimensional way through right action. Knowing this, for me, identifies that rights and responsibilities are intimately and intricately connected, and changing the balance of these affects the balance of the system of our world. Think of the ripple effect of a stone thrown into water. The single most useful thing I believe that I teach the families with whom I work is to connect their children’s rights to responsibilities. It has been the most helpful thing identified by those families in the work they have done with me. The successful trilogy is communication, forgiveness, linking rights and responsibilities. These three are different forms of mindfulness. I always think of caterpillars to butterflies as transformation and tadpoles to frogs as transmutation. Each are changing forms from one to another, transubstantiation, but the processes are very different. With the butterfly the caterpillar goes into a suspended animation state wherein the change takes place within the cocoon. The consciousness of the caterpillar shifts within that time from crawling, leaf eating caterpillar to winged, flying, nectar eating butterfly – transforming focus, mode of transportation, and shifting paradigm of self. The tadpole changes as it develops so the tadpole consciousness must also be letting go of the old paradigm while shifting into the new one from swimmer to jumper. Truly fascinating. I think our process of development is more similar to that of the tadpole we shift over time and develop into an in-between state before we settle on our final form. I think this is true of us from a spiritual, psychological, and cognitive perspective too. We transition out of a way of being and then into a neutral state and then into a new perspective. We can have immediate, aha, shifts like the one’s we experience with figure/ground recognition but usually for our self-perception there is a changing-space in-time before we embrace fully our new self. Snakes that shed their skins to shift into their new bodies incorporate aspects of both of these forms. Transitions are opportunities for transforming and transmutation we can change in response to and with our environment and our experiences. The new year, the new moon, anniversaries and birthdays are all transition times when one can consciously transition and make an intention about transformation and transmutation. Because they are opportunities to observe what has gone before and what we want to bring into or create in the future, these times offer a space-in-between to review and assess our form. Are we acting in ways that are congruent with what we say matters to us? Do we allow for space for growth and honestly work toward our own well-being and happiness? Are we holding onto an old structure or unforgiveness that we need to shed? Do we repair the world, our emotional and physical environment, and our relationships in a dynamic and ongoing way? These are important questions at these space-time shifts to help with our dynamic, ever-changing transformation and transmutation, our personal evolution. So whether you are faced with an unexpected transition or one that you are consciously creating, embrace the transformation process through observation, acceptance, allowing, and letting go to smoothly flow into your transformed self. You may discover that you are not an ugly duckling but a beautiful swan gliding through your environment… and how cool is that?